Til Schweiger is the next name to join QT's muched talked of Inglorious Bastards cast. 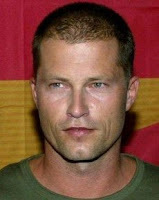 Schweiger is prmarily known for his foreign roles although he did apear in Laura Croft Tomb Raider: Cradle of Life, King Arthur and the terrible Sly Stone film Driven, will play another member of Lt. Aldo Raine's assembled team of Nazi killers. The rest of the cast includes Brad Pitt, Diane Kruger, Christoph Waltz, Daniel Bruhl, Eli Roth, Mike Myers, Michael Fassbender, B.J. Novak, Samm Levine and Paul Rust. Production is set to start on October 13th and QT plans to unveil the film at Cannes in 2009. Thoughts on Til Schweiger in Inglorious Bastards? Do you feel any more bog actors will join the cast or will the rest of the cast be played by lesser actors?